Between Loch Kishorn and Plockton, to the south, and Loch Torridon and Shieldaig, to the north, the peninsula has some of the most stunning sea and mountain landscapes in Britain. Cut off by its great wall of mountains, Applecross historically functioned like an island and was one of the most remote communities on mainland Britain. Only in the 1950’s did routine car access became possible. Now we are served by two roads, the formidable Bealach na Ba (the Pass of the Cattle) and the new road round the north coast completed in the 1970’s. The “Bealach” rises from sea level to over 2,000 feet. It offers the biggest climb of any road in Britain and has become a “must do” route for cyclists. In 2012, National Geographic magazine rated it one of the world’s greatest car journeys! “A REMOTE Highland road has been named alongside America’s famous Route 66 as one of the world’s greatest car journeys. The Applecross route in Wester Ross, which twists and turns through spectacular mountain scenery, has been named as one of the best places for a road trip by National Geographic. The US publishing giant says a drive along the former cattle track is every bit as exhilarating as Route 66, Hollywood’s Sunset Boulevard or the Silk Road across central Asia. 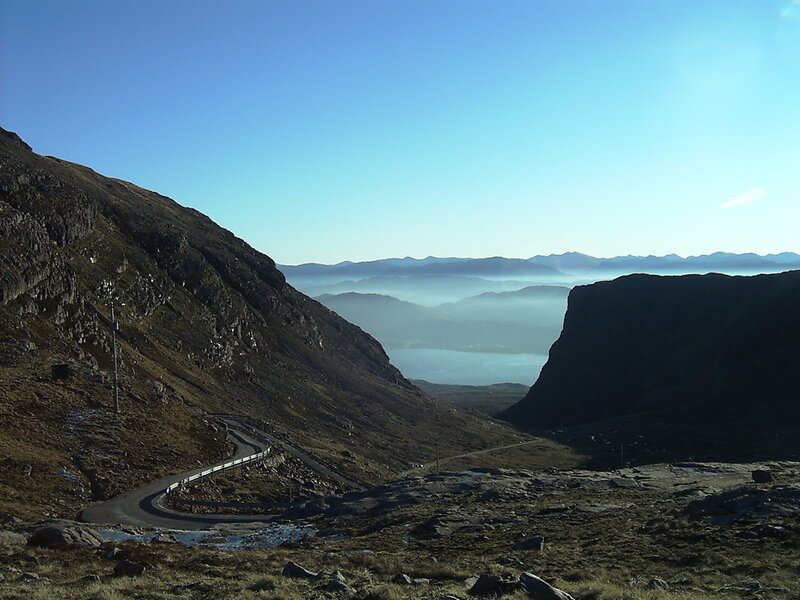 The heart-stopping hairpin bends of the Bealach na Ba in Applecross offer drivers the equivalent of a rollercoaster ride, says the magazine.” (from “The Scotsman”). To the many Gaelic speakers in the community, the peninsula is still known as “A’ Chomraich”, the Sanctuary, aptly reflecting both the area’s tranquility and the early Christian settlement established by St Maelrubha (aka Maree of Loch Maree etc) in the 7th century. Applecross has a rich history including: an abundance of Mesolithic sites from 5-7,000 BC, an Iron Age broch on the camp site (featured by Tony Robinson with the “Time Team” in April, 2006), Viking raids in the 9th century (responsible for the destruction of the monastery and the local Norse names, such as Toscaig), and even a visit from Flora MacDonald who, in the aftermath of Culloden, signed her confession on board HMS Furnace, in Applecross bay. Applecross is a very popular place to visit and our accommodation can be stretched. If you want to stay, early booking is strongly advised. There is one hotel, the renowned Applecross Inn, brilliantly run over more than 30 years by Judith Fish MBE. Phone 01520 744262. The camp site is beautifully situated, on the hillside above the main village, “Street”, and offers small wooden lodges (“wigwams”), and mobile homes, as well as camping. Phone 01520 744268.
and at Arrina (15 miles north of “Street”, by Transition) – Kalie 755291 . There are also several holiday homes if you are thinking of staying for more than just the weekend – see www.applecross.uk.com/. For a small community, we are very well provided for with two high quality eating places. Judy Fish and her team in the Applecross Inn have won numerous awards over the past decade. The Inn’s sea food is superb. The “Walled Garden” restaurant (next to Applecross House), is another Michelin listed award winner and offers haute cuisine in the atmospheric setting of a beautiful and historic garden. John and Elaine kindly allow us to take over the whole place for the Saturday evening. Booking is essential – phone 01520 744440. There is a general store, also the Post Office, based at Seonag’s B & B, in Camusteel. Just at the foot of the Bealach you will find the “Coal Shed” gift shop and the Fuel pumps (available 24 hours a day – card payment only).